The product came in our local post office just in time for Christmas, so it took me a while to get the product from the post office clerk after the Holiday. I was truly excited to learn about what Yalmeh product can benefit me. 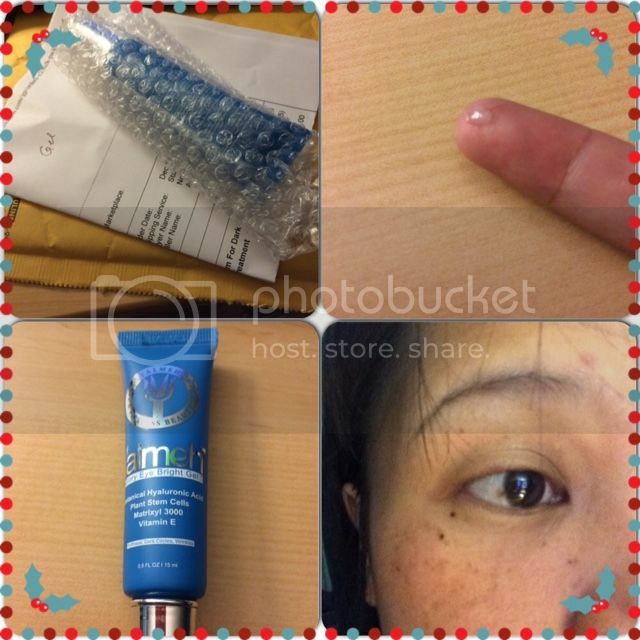 I have heard many different types of products and one of them is Yalmeh's Glory Eye Bright Gel that contains Botanical Hyaluronic Acid, Plant Stem Cells, Matrixyl 3000 which I search after I used the product to know more about what this is and of course with Vitamin E.
The packaging is good, it came with a bubble wrap envelope, the product is wrapped with a bubble wrap. I don't see any defect due to shipping and that's just great. The 0.5 fl oz/15 ML gel is okay if you want to try what would be the effect of the product to you. For me, I find it just too small, but when you try something new, might as well start with smaller amount rather than wasting your money knowing it doesn't do any good to you. Also, you only need a small amount to apply towards your forehead, around eyes, cheeks and pretty much all facial treatment. I would say, this product would help me restore a better and smoother looking face. Though it will take up to 3-4 weeks before I'll finally see the result, however, I'm feeling great whenever I applied the gel, and knowing that in the end there will be a better result to come. That's nice. Perfect for a Mom like you! I'm excited to know the results of your product testing after 3 or 4 weeks. I hope it turns out okay. By the way, what exactly does the Yalmeh Glory Eye Bright Gel do? This is perfect product to keep our eyes not saggy and still look healthy Mommy N. I need that kind of product especially that I am getting old.